Over half (57%) of advertisers are buying mobile ads via programmatic, with the majority of those mobile buys (35%) coming from agencies. 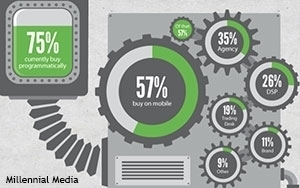 Demand-side platforms (DSPs) account for 26% of all mobile programmatic ad buys. Trading desks account for 19%. That’s according to an infographic released by Millennial Media earlier this week. The company surveyed an unspecified number of marketers and used data gathered from its own mobile ad exchange to create the infographic. The survey took place in April 2014. Much has been made of brands taking programmatic into their own hands, and the Millennial Media infographic found that 11% of all mobile programmatic ad buys have come straight from brands so far this year. That is in line with Casale Media’s Q1 2014 research that also found that 11% of all U.S. spend on programmatic came directly from brands. No matter who is doing the buying, spend is clearly on the rise. About 12% of campaigns cost between $1 and $5 million in 2013, but so far in 2014 about 22% of campaigns fall into that price range. Only 1% of campaigns cost between $5 and $15 million in 2103, but that number is up to 11% through four months this year. Similarly, 4% of campaigns have cost more than $15 million this year, up from 2% last year. About 85% of campaigns spent less than $1 million in 2013, and that figure has dropped to 63% so far in 2014. Of survey respondents, 46% were agencies, 17% were DSPs, 14% were brands, 13% were trading desks and 10% were “other.” You can see the full infographic here.